The present city of Baltimore dates from July 30, 1729, and is named after Cæcilius Calvert, Lord Baltimore, who was the first Proprietary Governor of the Province of Maryland. Like many early U.S. cities, this name originated from Europe. Maryland was one the original thirteen colonies that declared its independence from Great Britain on July 4, 1776. Although it initially formed part of Virginia, Maryland became a separate colony under a charter granted to Lord Baltimore in 1634 and it became the 7th U.S. state when it ratified the U.S. Constitution on April 28, 1788. George Calvert (1579–1632), First Baron Baltimore, Eighth Proprietary Governor of Newfoundland, applied to King Charles I for a royal charter for what was to become the Province of Maryland, but he died five weeks before the new Charter was sealed, leaving the settlement of the Maryland colony to his son Cæcilius (Cecil) Calvert (1605–1675). George Calvert was awarded the Barony of Baltimore in County Cork Ireland in 1625 by King James I of England and hence became the first Lord Baltimore. Although initially part of Virginia, Maryland became a separate colony under a charter granted to Lord Baltimore George Calvert (ca. 1579–15 April 1632) and it was established in 1634 under his son. After Calvert died in April 1632, the charter for "Maryland Colony" (in Latin Terra Mariae) was granted to Cecilius (Cecil) Calvert (8 August 1605--30 November 1675), 2nd Baron Baltimore, on June 20, 1632. Although Cecil delegated his younger brother Leonard Calvert to serve as governor of the new colony, Leonard would not arrive at the colony until March 25, 1634, which would later to be celebrated as "Maryland Day" (an official state and local holiday). His title was "Cecil Calvert, Second Baron Baltimore, First Lord Proprietary, Earl Palatine of the Provinces of Maryland and Avalon in America". The colony was named in honor of Queen Henrietta Maria, the wife of King Charles I, and the specific name given in the charter was phrased Terra Mariae, anglice, Maryland. 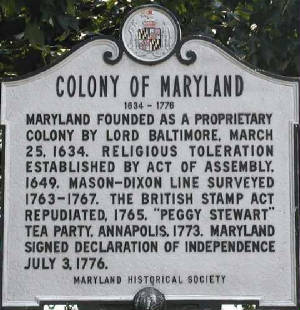 The name "Baltimore" is derived from the County Longford, Ireland manor of the Calvert family, the Lords Baltimore, who founded Maryland in 1634. Of course it is not the only place in the state to have received its name through various associations with the Calverts: Cecil, Calvert, Harford, Ann Arundel Counties, and Leonardtown are other examples. Cecil Calvert, Second Lord Baltimore named the colony for Queen Henrietta Maria, consort of the then king of England, Charles l, who granted the charter for the colony in 1632. 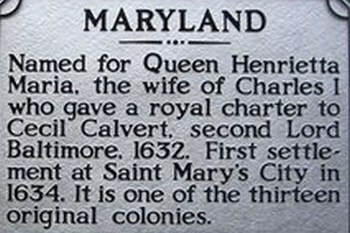 The colony of Maryland had its origins with Calvert's father, George, the first Lord Baltimore. George, a Secretary of State to James I, was rewarded by the king with title to land in Newfoundland for a colony the Yorkshire landowner dubbed "Avalon." After he and his colonists became disheartened by the frigid climate in Newfoundland, George thought better of the venture and petitioned James I's son, Charles I, for title to land north of the existing English colony of Virginia. In June 1632, two months after George Calvert's death, the king signed the final charter for Maryland, with title for the grant going to George's eldest son and heir, Cecil. The St. Paul Street statue, erected November 21, 1908, under the auspices of the Society of Colonial Wars of the State of Maryland, celebrates the fact that Cecil "established in ... Maryland for the first time in the English-speaking world freedom of religious worship ... [of] any Christian form and separation of church and state." In 1634, when Maryland was born, people lived in a very intolerant era. The Thirty Years War (1618 -1648) was raging in Europe between Catholic and Protestant forces, and the Calverts entered the "perilous path" in 1625 when George Calvert left public life and declared himself a Catholic. Thus, when the newly-created Baron of Baltimore visited Jamestown before his death, he was treated with suspicion by the leaders of Virginia because of his "Romish" religion and the fact that he would be taking lands the Virginians claimed to be theirs. In 1631, three years before Cecil Calvert's band of settlers arrived at the Chesapeake, William Claiborne, Secretary of State of Virginia, had already established a trading post on Kent Island. Jesuit priest Andrew White, chronicler of the Maryland settlement, wrote that the Virginia council desired nothing more than the colonists' "ruine." He said that Claiborne had apparently stirred up the local Indians against the Maryland colonists. Indeed, he said, the settlers learned that the "Indians were all in armes to resist us," having been told that the Spanish were coming to destroy them all. White attributed this rumor to Claiborne, who was actively trying to undermine the new colony. Fortunately, relations with the Indians proved friendly in the vicinity of the new settlement of St. Mary's City, where Cecil's brother Philip Calvert established the strong point for the Maryland colony. The same could not be said for Claiborne who, although first tolerated by the Calverts, was shortly to be declared an outlaw after his men fought a battle with the Marylanders at the Pocomoke River in 1635. The Marylanders seized Kent Island, displacing the Virginians. Who is the Founder of Maryland? Although the Calverts successfully established the Maryland colony, Calvert rule would continue to be rocky. This rockiness was partly the result of less than consistent rule by the Calverts themselves and also a result of the Maryland economy being solely based on tobacco. During the English Civil War of 1641-1645, Claiborne once more seized Kent Island for a brief period starting in fall 1644. Then Richard Ingle, a supporter of Parliament, captured and plundered St. Mary's City in February 1645. Philip Calvert retook St. Mary's late in 1646. In 1689, however, Protestant rebels overthrew the government of the third Lord Baltimore. A series of Royal governors held the reigns of state until 1715. One of them, Francis Nichlolson, relocated the state's capital from St. Mary's City to Annapolis, in part to break the Catholic stranglehold on the colony. After Lord Baltimore's reinstatement to rule, Governor Charles Calvert tried to assure the assembly in 1722 that Baltimore stood to them "as a bountyfull Indulgent Father toward a dutiful Deserving son." But Baltimore's veto of acts passed by the assembly, and attempts to reassert his rights such as taxing exports of tobacco, alienated the colonists. Baltimore tried to improve matters by changing governors but unhappiness with his policies persisted. In November, 1732, Charles, the fifth Lord Baltimore, arrived in Annapolis for a six-month visit. He consented to an act establishing paper money, backed by tobacco export, in an effort to improve the economy. But he persisted in reviving the system of collecting rents and in maintaining fees to office-holders. When Frederick, the sixth Lord Baltimore, died in 1771, his will proclaimed the new proprietor to be his illegitimate son, Henry Harford. Harford was proprietor when the last governor, Robert Eden, was overthrown in 1775 at the Start of the American Revolution. Ironically, it was a descendant of another Calvert who would have an influence into modern times, while Lord Baltimore's old feudal line dissolved. Maryland: Civil War and Beyond. Sources: Christopher T. George, Baltimore Close Up (Arcadia Publishing), September 3, 1998; Alexander D. Mitchell IV, Baltimore Then and Now (Then & Now) (Thunder Bay Press), May 1, 2002; historical markers provided courtesy State of Maryland, Maryland State Archives, and Maryland Historical Trust. Recommended Reading: Maryland, A Middle Temperament: 1634-1980 (Maryland Paperback Bookshelf) (864 pages) (The Johns Hopkins University Press). Review From Library Journal: A history of the third original colony with 350 years of tobacco culture, slavery, industrial revolution, civil war, and civil rights is a daunting task met by Brugger in his highly readable standard history of the state. Brugger not only covers the pageant of centuries but also finds a theme of moderation and balance in a not-quite Southern but not-quite Northern realm where both cool heads and Union occupation prevented secession. Writing over the last three years, Brugger recognizes the findings of younger historians who have wrung fresh insights about colonial living from statistics and archaeology. He is not reticent about long-denied civil rights, old political machines, and fairly recent corruption. Independent Review: Maryland: A Middle Temperament explores the ironies, contradictions, and compromises that give "America's oldest border state" its special character. Extensively illustrated and accompanied by bibliography, maps, charts, and tables, Robert Brugger's vivid account of the state's political, economic, social, and cultural heritage, including: Who was the Founder of Maryland? Cecil Calvert's Expedition to the opening of Baltimore's Harborplace, and an exhaustive history of the nation's third original colony. This splendid book is rich in the issues and personalities that comprise Maryland's story and explain its "middle temperament." Recommended Reading: Frommer's Maryland & Delaware (Frommer's Complete). Description: Brought to you by America’s #1 bestselling travel series... Written by more than 175 outspoken travelers around the globe, Frommer’s Complete Guides help travelers experience places the way locals do. You'll never fall into the tourist traps when you travel with Frommer's. It's like having a friend show you around, taking you to the places locals like best. Our expert authors have already gone everywhere you might go--they've done the legwork for you, and they're not afraid to tell it like it is, saving you time and money. No other series offers candid reviews of so many hotels and restaurants in all price ranges. Every Frommer's Travel Guide is up-to-date, with exact prices for everything, dozens of color maps, and exciting coverage of sports, shopping, and nightlife. You'd be lost without us! From Civil War battlefields to Baltimore's National Aquarium, these two states offer a wealth of sightseeing and activities. Frommer's is on top of it all, with complete coverage of the best beaches, Oriole Park at Camden Yards, the world-renowned Longwood Gardens, the Winterthur Museum, scenic Chesapeake Bay, beautiful, mountainous Western Maryland, the best crab houses and brewpubs, outdoor adventures, antiquing, and much more. It's all at your fingertips, in true Frommer's style, with dozens of accurate maps, the best hotels and restaurant s in all price ranges, detailed practical tips, and more. Frommer's Maryland & Delaware offers a wealth of sightseeing, sports, strolls, and special moments--from highlights for the first-time visitor to off-the-beaten-track discoveries that will impress even the most seasoned traveler. History and facts for Lord Baltimore, Founder of Maryland, Who is the Founder of Maryland, When did Maryland become a state, Lord Baltimore: The Founder of Maryland, When was Maryland Founded, History of Maryland, Date Maryland became a State, Maryland Photos and Pictures.